To those who are building the CR90, there are a few things you should know about it. As you may know, one of the reasons Mortesv couldn't produce the actual file is because of certain things the program wouldn't let him do. Although the file I've produced is mainly complete, there are a few things you should know before collecting parts and building the ship. 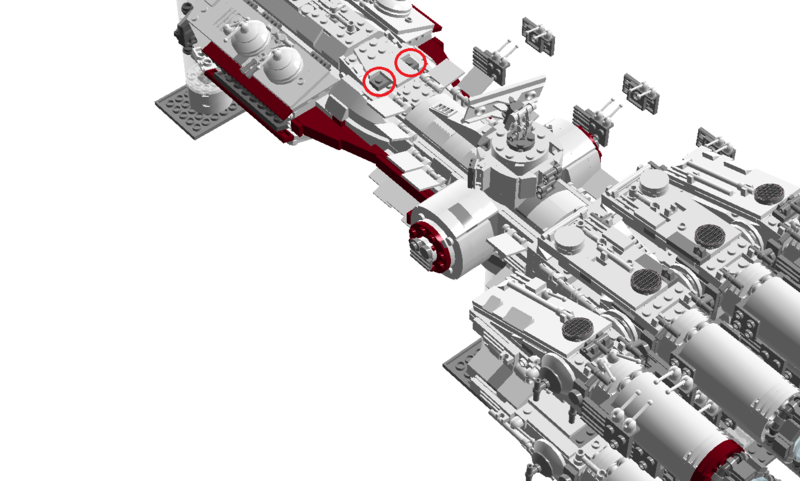 -On the light bluish gray rectangular greebling on the sides of the top and bottom rows of engines, take away the 2 x 2 plates underneath. Also, there are some loose ones not connected to the main ship - just attach them when necessary. The two spots circled in red are where you should attach them. There is also a similar spot on the bottom of the ship where you also need to put them. 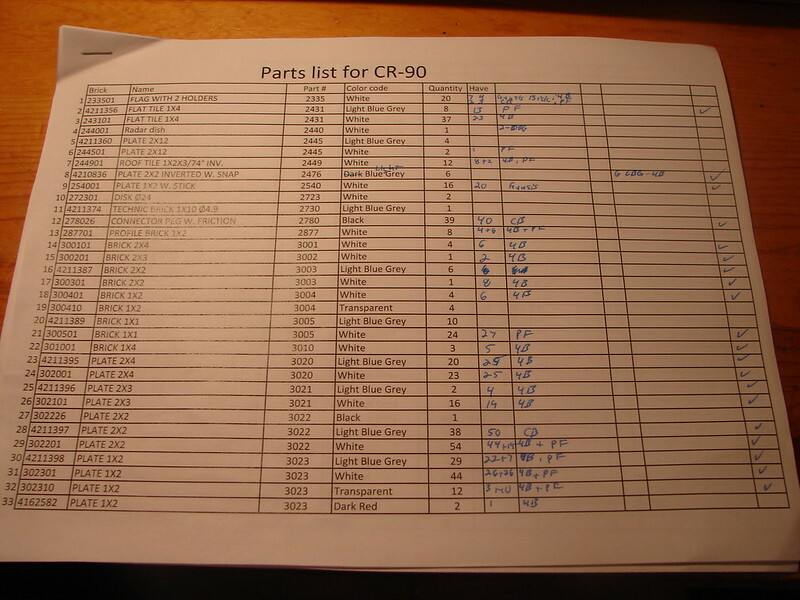 So, add 2 of part 24299 and 2 of part 24307 to your parts list. -One last thing: in the engine section, you don't have to use all of the 1 x 16 technic bricks, and pins. I just reinforced that area because I thought the engine section would be especially delicate, but It's probably fine without. But this is just optional, I still think I'll do it. File successfully downloaded! Thanks again! Any rare parts? I just checked on the radar dish (#2440) in white and it's fairly available although was last seen on the 10198 Rebel blockade runner. Part 2476 in dark bluish gray seems to be rare. . .
Everybody please add 2 of part 30374 in white and 6 of part 3062 in white!!! On one side of the engines, I didn't add the 2 tubes in between the top and bottom rows of engines. One decision point will be to decide to use New or risk Used white pieces. Agreed! Many white parts can turn out to be in very poor condition when bought used. That just shows battle damage! True . And there is a significant price difference. . .
@EKae Huge thanks to you for taking the effort to reverse engineer Mortesv's Tantive IV! @Azrielsc Will you be building it? Should be in the pipeline! But I am a slow builder so I don't see it happening for the next few months. Do you know where the 6x2476 parts go? Do they have to be DBG? Since this is out there, I might just as well share my own ldd. I was actually going to make instructions for it, but I don't know if there is interest now the ldd's are out there? I have also designed it in two sections, that you stick together. I think the 2 x 2 round bricks in the engines cores are a bit redundant. Instructions would be so much better @mortesv! I don't think anybody could say no to instructions. Regardless of how that pans out, I would definitely love to build this thing myself, it looks truly incredible. @mortesv Instructions would be fantastic! As you know, digital designer isn't the greatest for that. . . do you know how long it would take to produce the instructions? (@ecmo47) - regarding those bricks. I put on the middle engines using technic bricks, but those could do the trick as well - they are used on the 10019 as far as I remember. But get them NEW since the pin part of them can be a bit soft on used bricks and make your engines sack. Thanks! Also, can people just start collecting the parts with the list from my version? Then people can always just add or take away parts once you release the instructions. . . I finally dug down to where the six 2476's go. You can see the edge of them just behind that tube assemble that you forgot on the starboard (right) side. I'm going to use LBG ones. @ecmo47 You can always start collecting/building now with my LDD, then modify or add parts to it when the instructions are available - I think I'll begin gathering parts using my LDD, then wait until the instructions are out. Thanks for the link on the hammerhead! I'm tempted to get the complete set for $165.00 as I always go overboard Bricklinking parts. I'm about 2/3 sourced for the CR-90 and have spent about $250.00. I've got an updated Excel spreadsheet parts list that I'm using if anybody is interested. It's 7 pages in "Landscape" format. I've striped out all the pictures created by the LDD BOM and modified part numbers as needed (3069 = 3069b). I've also identified any part that can have two different numbers like the stud jumpers which can be either 3794 or 15573. Shot me a PM with an email address and I'll send it to you. - I am not sure of the skeleton design of the body - it seems a bit overly complex and not 100% sturdy when you would grab the model there, but I could be wrong? I think you all know the instructions maker working on this :) I'll let him give you an ETA on the instructions. Some of you may be thinking why I don't just share my ldd file already. The reason is instructions are being made and having the original ldd file might put people off getting the instructions which in turn would make spending a 100+ hours making instructions less worth it.